As a professional cleaner, you’ll know that it is vital that cleaning tasks as a whole and the cleaning chemicals and tools used are properly assessed before use. To ensure cleaning tasks are carried out safely, you should carefully follow procedures before the cleaning job commences. This involves reading the product’s safety data sheet before using the cleaning chemical and filing the sheet where it can be quickly referred to if you or your colleagues or employees encounter any problems while using the chemical. A risk assessment sheet which outlines the cleaning task at hand along with the tools and chemicals which will be used and the risks involved in the cleaning task should also be made and referred to. Employers have a legal obligation to protect their health and safety and that of their workforce. Regulation 3, of the Management of Health and Safety at Work Regulations 1999, requires, among other things, that all employers assess the risks to the health and safety of their employees while they are at work. A good risk assessment will help avoid accidents and ill health, which can not only ruin lives, but can also increase costs to business through lost output, compensation claims and higher insurance premiums. 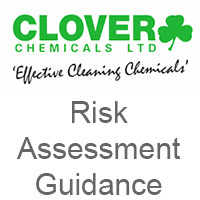 Clover Chemicals have developed a handy risk assessment guidance sheet where you can add the details of the cleaning chemical you’ll be using. This guide will help you to think about the risks that may be involved in your particular cleaning tasks. Clover Chemicals manufacture a huge range of cleaning chemicals for professional use. The Clover Chemicals range includes everyday floor cleaners, kitchen degreasers, disinfectants, hand soap, car valeting products and graffiti removal chemicals. Their range of professional cleaning chemicals will help you to tackle most professional cleaning tasks. The example risk assessment guidance sheet shows the kind of approach a small business might take. It can be used as a guide to think through some of the hazards in your business and the steps you need to take to control the risks. Please note that it is not a generic risk assessment that you can just put your company name on and adopt wholesale without any thought. This would not satisfy the law – and would not be effective in protecting people. Every business is different – you need to think about the hazards and controls your business needs. Even where the hazards are the same, the control measures you adopt may have to be different from those in the examples to meet the particular conditions in your workplace. Please click the link to use Clover Chemical’s Risk Assesment Guidance.